The pretrib rapture is a fantasy that contradicts the fundamental teaching of the Bible that the righteous have always had trials and tribulations. We will go through the Great Tribulation. He dares to tell the truth about the Laodicean church today, the church of America that is lukewarm and sinful. He calls for repentance, praying more, fasting more, learning the Bible and turning off the TV set. He teaches the true identity of Mystery Babylon: The United States of America. He shares the unpleasant news that we will all have to move, just as Revelation 18 predicts, as part of God's end time plan to gather and protect us for the three and one half year Great Tribulation. I owe thanks to Benjamin's book for introducing me to the concept that the 144,000 were going to be sent out by God two by two just as Jesus sent out the twelve and seventy. This was a genuine insight that I found confirmed by Scripture. 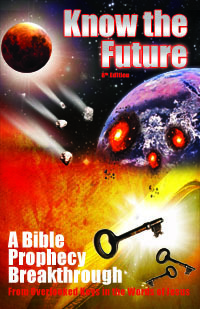 In my own book, Know the Future, I dig deeper and show that it was actually seventy-two that Jesus sent out, which of course is 144,000 divided by two or 1000 pairs of evangelists sent out to fulfill the end time witness before the end comes that Jesus spoke of in Matthew 24:14 in all seventy-two of the nations listed in Genesis 10 - (LXX). Of course, it goes without saying I do not agree with everything in Benjamin's book. For example, true to the title of the book, in the first edition he made some projections on timing that came and went without event, such as the 80 years of Psalm 90 starting in 1917 with the Balfour Declaration and ending in 1997. This is based on the Parable of the Fig Tree viewed as an end time prophecy. I have never been able make that parable work as a prophecy except in the First Century (30 AD + 40 years of a wicked generation = 70 AD when the Temple was destroyed and the Jews scattered) so I no longer consider it a prophecy we can use predictively for the end times. But to me, setting dates and attempting to peer through the veil is a forgivable mistake in light of the many sound points and insights the book makes. I heartily recommend The Day of the LORD is at Hand for how it can teach you important biblical concepts you will not learn in church.